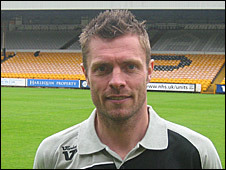 Port Vale assistant manager Geoff Horsfield admits that he may retire from football at the end of the season, if his injury record does not improve. The 36-year-old has managed just one start and 10 substitute appearances since his arrival at Vale Park in July. Horsfield told BBC Radio Stoke: "I keep picking niggling injuries up. "I'll be working towards playing next season, but I'll review it at the end of the season. If I keep picking those injuries up, I'll call it a day." Former Fulham, Birmingham City and West Bromwich Albion striker Horsfield has made almost 400 appearances, scoring 126 goals, since making his name by firing Halifax Town back into the Football League in 1998 at the age of 25. He is currently on the verge of full fitness after another six weeks out of action with a torn hamstring. And Horsfield, who beat cancer to return to league football with Vale last summer, hopes to be involved when Macclesfield visit Vale Park on 23 January. "With not having any games, I've been able to get my fitness work in," said Horsfield, "not on the training pitch but in the gym. "Hopefully I'll not be too far away when that game comes."